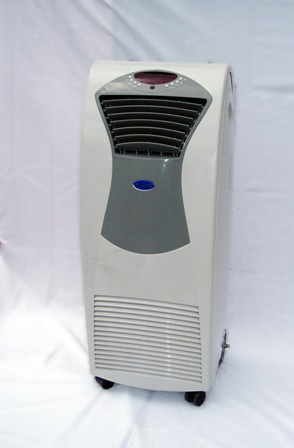 This is the most powerful mono bloc air conditioner available in the UK. It has a similar output to wall-mounted air conditioning systems but without all the cost and hassle of having to install it. This unit is ideal for large rooms, conservatories, offices or server rooms. As this is such a powerful unit it may not be f suitable for quiet areas, like bedrooms, as its noisier than other smaller units. As it is a monobloc system it needs to vent the hot air outside so it’s vent hose must be fed through a slightly open window or door. However, the window adaptor also supplied enables you to do this with a minimum of air being allowed into the room. 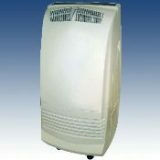 Also, unlike many other portable air conditioners it does not have a water tank that needs to be regularly emptied. The condensation that builds up on the chilled internal components is simply evaporated through the extraction hose. Its easy-roll castors make it simple to move around and the LCD remote control gives full control over operations. This air conditioner also has digital push-button controls rather than knobs and dials to turn making it easy to operate. Adjustable louvres make it possible to direct the cool air to provide maximum cooling.